Chronic lymphocytic leukemia (CLL) can be divided into prognostically distinct subsets with stereotyped or non-stereotyped, mutated or unmutated B cell receptors (BCRs). Individual subsets vary in antigen specificity and origin, but the impact of antigenic pressure on the CLL BCR repertoire remains unknown. Here, we employed IgH.TEμ mice that spontaneously develop CLL, expressing mostly unmutated BCRs of which ~35% harbor VH11-2/Vκ14-126 and recognize phosphatidylcholine. Proportions of VH11/Vκ14-expressing CLL were increased in the absence of functional germinal centers in IgH.TEμ mice deficient for CD40L or activation-induced cytidine deaminase. Conversely, in vivo T cell-dependent immunization decreased the proportions of VH11/Vκ14-expressing CLL. Furthermore, CLL onset was accelerated by enhanced BCR signaling in Siglec-G−/− mice or in mice expressing constitutively active Bruton's tyrosine kinase. Transcriptional profiling revealed that VH11 and non-VH11 CLL differed in the upregulation of specific pathways implicated in cell signaling and metabolism. Interestingly, principal component analyses using the 148 differentially expressed genes revealed that VH11 and non-VH11 CLL clustered with BCR-stimulated and anti-CD40-stimulated B cells, respectively. We identified an expression signature consisting of 13 genes that were differentially expressed in a larger panel of T cell-dependent non-VH11 CLL compared with T cell-independent VH11/Vκ14 or mutated IgH.TEμ CLL. Parallel differences in the expression of these 13 signature genes were observed between heterogeneous and stereotypic human unmutated CLL. Our findings provide evidence for two distinct unmutated CLL subsets with a specific transcriptional signature: one is T cell-independent and B-1 cell-derived while the other arises upon antigen stimulation in the context of T-cell help. Chronic lymphocytic leukemia (CLL) is the most common adult leukemia characterized by an accumulation of monoclonal CD5+ mature B cells with low surface immunoglobulin (Ig) expression in peripheral blood (1). CLL is a clinically and molecularly heterogeneous disease whereby progression is influenced by many factors. One-third of patients can be classified as stereotypic CLL, in which BCRs are highly similar between patients (2). The remaining two-third of CLL either lack or have limited similarity with stereotyped CLL BCRs. This classification provides strong molecular evidence for antigen selection in CLL pathogenesis (2). CLL can also be grouped based on IGHV mutational status (3, 4). Significant (>2%) somatic hypermutation (SHM) is observed in patients with mutated CLL (M-CLL), who often develop indolent disease. SHM is absent in unmutated CLL (U-CLL) which evolves rapidly and has a less favorable prognosis (4). The SHM status provides a robust and stable prognostic marker, independently of clinical stage and other markers (5). Furthermore, it reinforces the role of selection by self-antigens or exogenous antigens in CLL pathogenesis. CLL cells show constitutive activation of several BCR downstream kinases, increasing leukemic cell survival in vitro (6). In support, small molecule inhibitors of BCR–associated kinases including Bruton's tyrosine kinase (Btk) have shown impressive clinical anti-tumor activity (7, 8). Few external antigens that potentially drive CLL in vivo have been identified; CLL cells were shown to display antigen-independent, cell-autonomous signaling mediated by auto-recognition (9). Several reports have shown that U-CLL express polyreactive BCRs that bind with low affinity to various auto-antigens generated during apoptosis or oxidation (10, 11). In this respect, they resemble natural antibodies secreted by B-1 cells in mice. B-1 cells are a self-renewing CD5+ B cell population with remarkably restricted IGHV gene usage and low or no SHM (12). B-1 cells are thought to be generated based on positive selection, by virtue of their receptor specificities to self-antigens, independent of T-cell help (12). Adding to this complexity, the antigen specificity of U-CLL includes both T cell-independent (TI) and T cell-dependent (TD) antigens (11, 13, 14). On the other hand, M-CLL express BCRs that are believed to bind with high-affinity to auto-antigens and show activation of pathways associated with anergic B cells (15, 16). Differences regarding BCR reactivity have fueled several theories concerning the cellular origins of CLL. SHM status and transcription profiling indicated that U-CLL and M-CLL are derived from CD5+CD27− pre- and CD5+CD27+ post-germinal center (GC) B cells, respectively (17, 18). Extrafollicular or marginal zone (MZ) B cell responses, involving the activation of low-affinity B cells to TI antigens with low SHM, could also be relevant for CLL (19). Direct in vivo evidence for the TD or TI origin of CLL subgroups is still missing, mainly due to a lack of mouse models that spontaneously develop both stereotypic and non-stereotypic, mutated and unmutated CLL (20). In the widely studied Eμ-TCL1 model, CLL predominantly express unmutated stereotyped IghV11 or IghV12 BCRs (21). 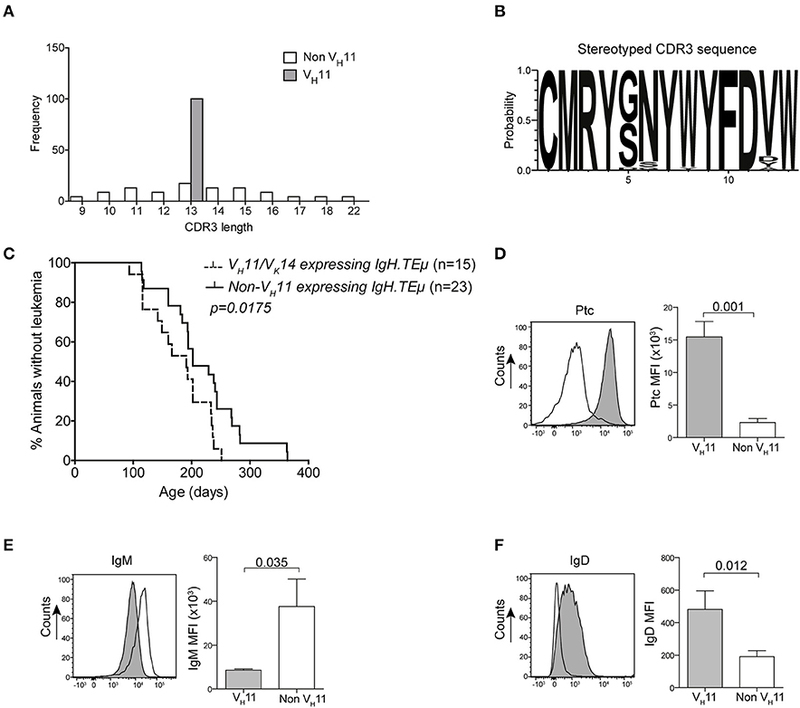 The IgH.TEμ CLL mouse model that we previously generated is based on sporadic expression of the SV40 large T oncogene in mature B cells (22). This was achieved by SV40 large T insertion in opposite transcriptional orientation into the IgH locus DH-JH region. In contrast to the Eμ-TCL1 model, IgH.TEμ mice mainly develop unmutated CLL with a diverse IghV repertoire, and at low frequencies mutated CLL (20, 22). Because of their mixed sv129xC57BL/6 background, we used IgMa/IgMb allotype expression to define CLL incidence by the accumulation of >70% IgMb+ B-cells (22, 23). 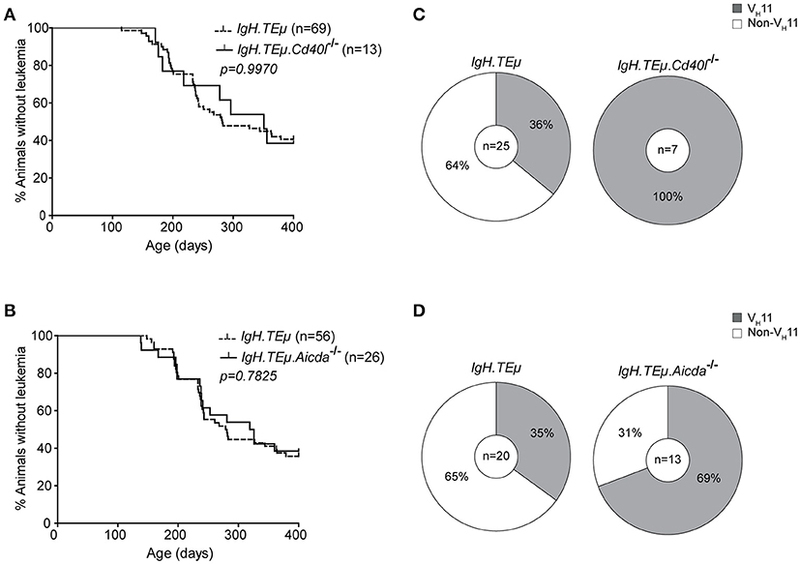 Aging IgH.TEμ mice show accumulation of monoclonal CLL-like CD5+CD43+IgM+IgDlowCD19+ B cells around nine months of age. Although constitutive Btk signaling was not apparent in primary IgH.TEμ CLL cells, CLL development was dependent on Btk. Btk-mediated signaling enhanced leukemogenesis and Btk-deficiency led to a complete rescue from the disease (23). Moreover, primary CLL cells from IgH.TEμ mice or stable cell lines generated from these mice had detectable expression of p-Akt and substantial levels of p-S6, both of which function downstream of the BCR (23, 24). To address the impact of antigenic pressure on BCR selection in CLL, we analyzed the effects of defective T cell help and GC formation, as well as robust antigenic stimulation on CLL development in IgH.TEμ mice. We show that there are two distinct unmutated CLL subsets present in the IgH.TEμ mouse model. The VH11-2/Vκ14-126-expressing CLL developed independently of T-cell help. Conversely, non-VH11 CLL was TD and displayed a specific transcriptional signature associated with non-stereotypic U-CLL in human. These findings provide evidence for differential dependence on T cell help in unmutated CLL in mice and suggest that development of human U-CLL can also be T cell-dependent. Mice (C57BL/6) deficient for Cd40l (25), Aicda (26) or Siglec-G (27), and Cd19-E-Btk-2 (28) transgenic mice were crossed to IgH.TEμ mice (F1 sv129xC57BL/6). CLL development was monitored every 3–6 weeks by screening peripheral blood for a monoclonal B cell expansion using flow cytometry. CLL formation was defined by accumulation of >70% IgMb+ B-cells in the peripheral blood of the mice. Mice were sacrificed after detection of CLL. Mice were bred and kept in the Erasmus MC experimental animal facility and experiments were approved by the Erasmus MC committee of animal experiments. Primary patient material was obtained from peripheral blood from CLL patients, while peripheral blood from healthy controls (>50 years of age) was obtained via Erasmus MC and via Sanquin blood bank (Rotterdam). Diagnostic and control samples were collected upon informed consent and anonymized for further use, following the guidelines of the Institutional Review Board, and in accordance with the declaration of Helsinki. The BCR characteristics of all CLL patients are included in Supplementary Table 5. Peripheral blood mononuclear cells (PBMCs) were isolated using Ficoll Hypaque (GE Healthcare, Little Chalfont, UK) according to the manufacturer's instructions. Naïve mature B cells were isolated from healthy control PBMCs using FACS-purification for CD19+CD27-IgD+ cells. The purity of naïve mature healthy B cell samples was >95% as determined by flow cytometry. TD immune responses were induced by i.p. immunization. Primary immunizations were induced in 10-12-week-old mice with 100 μg TNP-KLH on alum. After 5 weeks this was followed by a secondary immunization with 100 μg TNP-KLH in PBS (28). Primer sequences and PCR condition were previously described (22, 23). PCR products were directly sequenced using the BigDye terminator cycle sequencing kit with AmpliTaq DNA polymerase on an ABI 3130xl automated sequencer (Applied Biosystems). Sequences were analyzed using IMGT/V-Quest (http://www.imgt.org, using Ig gene nomenclature as provided by IMGT). All sequences were confirmed in at least one duplicate analysis. Preparation of single-cell suspensions of lymphoid organs and lysis of red blood cells were performed according to standard procedures. Cells were (in)directly stained in flow cytometry buffer (PBS, supplemented with 0.25% BSA, 0.5 mM EDTA and 0.05% sodium azide) using the following fluorochrome or biotin-conjugated monoclonal antibodies or reagents: anti-B220 (RA3-6B2), anti-CD19 (ID3), anti-CD5 (53-7.3), anti-CD43 (R2/60), anti-CD23 (B3B4) all from eBioscience and anti-CD138 (281-2), anti-CD95 (Jo2), anti-IgD (11-26), anti-IgMb (AF6-78), anti-IgMa (DS-1), anti-Igλ (R26-46), anti-Igκ (187.1), anti-CD21 (7G6), all from BD biosciences, using conjugated streptavidin (eBioscience) as a second step for biotin-conjugated antibodies. Leukemic cells (CD19+CD5+) were stained with fluorescein-labeled phosphatidylcholine (PtC) liposomes (DOPC/CHOL 55:45, Formumax Scientific Inc.) in flow cytometry buffer. Cells were co-stained with anti-CD19, anti-CD43, or anti-CD5 (BD Biosciences). Splenic single-cell suspensions were prepared in magnetic-activated cell sorting (MACS) buffer (PBS/2mM EDTA/0.5%BSA) and naïve splenic B cells from 8–12 week-old WT C57BL/6 mice were purified by MACS, as previously described (24, 29). Non-B cells, B-1 cells, GC B cells, and plasma cells were first labeled with biotinylated antibodies (BD Biosciences) to CD5 (53–7.3), CD11b (M1-70), CD43 (S7), CD95 (Jo2), CD138 (281-2), Gr-1 (RB6-8C5), and TER-119 (PK136) and subsequently with streptavidin-conjugated magnetic beads (Miltenyi Biotec). Purity of MACS-sorted naïve B cells was confirmed by flow cytometry (typically > 99% CD19+ cells). To obtain activated B cells, purified naïve WT B cells were cultured in culture medium [RPMI 1640 (life technologies)/10% FCS (gibco)/50 μg/mL gentamycin(life technologies)/0,05 mM ß-mercaptoethanol (Sigma)] in the presence of 10 μg/ml F(ab')2 anti-IgM (Jackson Immunoresearch) for 12 h.
RNA was extracted from naive or activated splenic B cells, as well as from purified (using MACS-purification for CD19+ cells) primary tumors from IgH.TEμ mice with the RNeasy Micro kit (Qiagen) according to manufacturer's instructions. The TruSeq RNA Library Prep kit (Illumina) was used to construct mRNA sequencing libraries that were sequenced on an Illumina HiSeq 2500 (single read mode, 36 bp read length). Raw reads were aligned using Bowtie to murine transcripts (RefSeq database) from the University of California at Santa Cruz (UCSC) mouse genome annotation (NCBI37/mm9) (30). Differential gene expression analysis was performed using DESeq2 (31) with an adjusted P-value (false discovery rate; FDR) of P < 0.05. Log2-fold changes and FDR values as calculated by DESeq2 were used to generate a volcano plot using R (R studio version 1.1.383). Normalized gene expression levels quantified as reads per kilobase of a transcript per million mapped reads (RPKMs) were used for various clustering approaches (unsupervised hierarchical clustering, supervised clustering, and PCA) that were performed using R and PAST software (https://folk.uio.no/ohammer/past/). Visualization of clustering analysis output was performed using R, PAST, and Java TreeView (32). Molecular pathway enrichments were obtained from the online MSigDB database. Gene expression data for anti-CD40 plus IL-4 stimulated follicular B-cells was obtained from previously reported data and downloaded from the Gene Expression Omnibus (GEO; accession number GSE77744) (33). RNA-Seq data generated in this study have been deposited in the GEO database (accession number GSE117713). Samples tested in qRT-PCR were from IgH.TEμ (7 VH11 and 15 non-VH11), from IgH.TEμ.Aicda−/− (4 VH11 and 4 non-VH11), and from IgH.TEμ.TD (4 non-VH11) mouse groups. For quantitative RT-PCR analysis, TaqMan probes were employed. Probe Finder software (Roche Applied Science), the Universal Probe Library (Roche Applied Science) and Ensembl genome browser (http://www.ensembl.org/) were used for primer and probe design. Taqman Universal Master Mix II, was purchased from Thermo Fisher Scientific. Quantitative RT-PCR was performed by using the 7300 Real Time PCR system (Applied Biosciences) according to manufacturer's instructions. Gene expression was analyzed with an ABI Prism 7300 Sequence Detector and ABI Prism Sequence Detection Software version 1.4 (Applied Biosystems). Cycle-threshold levels were calculated for each gene and the housekeeping gene glyceraldehyde-3-phosphate dehydrogenase (Gapdh) was used for normalization of the values. All primer sequences and probe numbers are listed in Supplementary Table 7. Statistical analysis was performed using GraphPad Prism software (San Diego, California, USA) or R. The log rank test was used for calculating the level of significance for survival differences between mouse groups. The Chi-square test was used to determine the significance for BCR usage differences between different mouse groups. To evaluate differences in expression levels of different genes by qRT-PCR we used a Mann-Whitney U-test between two groups or a Kruskal-Wallis test corrected with Dunn's multiple comparison test for more than two groups. To analyze the BCR repertoire, we aged a panel of IgH.TEμ mice and collected blood every 3–6 weeks to monitor CLL incidence. Hereby, CLL incidence was defined by the accumulation of >70% IgMb+ B-cells, which displayed a CLL-like CD5+CD43+IgM+IgDlowCD19+ phenotype (22, 23). We performed sequencing analyses of Ig heavy (Igh) and light (Igl) chain transcripts and found that a substantial proportion (~36%) of CLL in IgH.TEμ mice expressed stereotyped BCRs consisting of the VH11-2 Igh chain, with similar Igh CDR3 length and amino acid sequences, and the Vκ14-126 Igl chain (22, 23) (Supplementary Table 1, Figures 1A,B). The VH11/Vκ14 CLL mice exhibited an earlier disease onset compared with IgH.TEμ mice with non-stereotypic (non-VH11) BCR (mean incidence age 184 days and 219 days, respectively, p = 0.0175) (Figure 1C). In wild-type mice the VH11-2/Vκ14-126 BCR is preferentially expressed by B-1 lymphocytes and shows specificity to phosphatidylcholine (PtC) (12). We could confirm PtC-binding specificity of VH11-2 BCRs on CLL cells (Figure 1D). VH11 CLL showed decreased surface IgM expression and increased surface IgD expression compared to non-VH11 CLL (Figures 1E,F). A major proportion (~65%) of the remaining non-VH11 CLL expressed a J558 VH1-family BCR with heterogeneous CDR3 length, amino acid sequence and Igl chain usage (Supplementary Table 1). VH1 CLL showed delayed disease onset (mean incidence age 231 days), compared with VH11 CLL (Supplementary Figure 1). Figure 1. Early onset of disease in VH11 expressing CLL from IgH.TEμ mice. (A) Bar graphs summarizing the distribution of CDR3 length in VH11 (gray, n = 15) vs. non-VH11 (white, n = 23) CLL from IgH.TEμ mice. (B) Web logo depicting stereotyped CDR3 amino acid sequence of VH11 (n = 15) CLL from IgH.TEμ mice. (C) Retrospective Kaplan-Meier incidence curves including IgH.TEμ mice with identified VH11 (dotted line) or non-VH11 BCR CLL (solid line). (D–F) Histogram showing flow cytometric analysis of CD19+CD5+CD43+ splenic CLL cells from VH11 (gray) vs. non-VH11 (black line) CLL from IgH.TEμ mice, stained with (D) phosphatidylcholine (PtC) liposomes or fluorochrome conjugated (E) anti-IgM or (F) anti-IgD antibodies. Bar graphs summarize mean fluorescence intensity of VH11 (gray) and non-VH11 CLL (n = 6 per group). In conclusion, based on Ig gene usage we could distinguish different subsets of unmutated IgH.TEμ CLL displaying differential disease onset. Because VH11/Vκ14-expressing CLL likely originate from B-1 cells, we hypothesized that they should still develop in the absence of functional GCs. Therefore, we investigated their dependence on functional GCs and T cell help by crossing IgH.TEμ mice with Cd40l−/− or Aicda−/− mice. Cd40l −/− or Aicda−/− mice display a complete lack or aberrant enlargement of GCs, respectively, paralleling the human hyper-IgM syndrome phenotype (26, 34). We monitored CLL incidence, as described above, in cohorts of Cd40l-deficient IgH.TEμ mice (IgH.TEμ.Cd40l−/−, n = 13), Aicda-deficient IgH.TEμ mice (IgH.TEμ.Aicda−/−, n = 26) and IgH.TEμ control littermates, n = 69 or n = 56, respectively for ~400 days (Figure 2). CLL frequency and onset was not altered in IgH.TEμ.Cd40l−/−mice (~59%, compared with ~62% in IgH.TEμ control littermates; p = 0.99) or in IgH.TEμ.Aicda−/− mice (~62%, compared with ~64% in IgH.TEμ control littermates; p = 0.78) (Figures 2A,B). Figure 2. 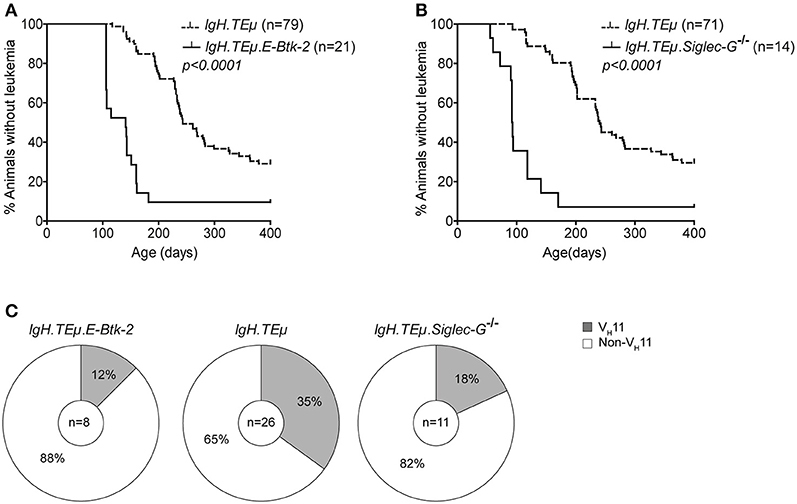 Increased frequency of VH11 usage in CLL from germinal center attenuated IgH.TEμ mice. (A,B) Kaplan-Meier incidence curves of (A) IgH.TEμ (dotted line) vs. IgH.TEμ.Cd40l−/− (solid line) mice or (B) IgH.TEμ (dotted line) vs. IgH.TEμ.Aicda−/− (solid line) mice. (C,D) Pie charts summarizing frequencies of VH11 BCR (gray) and non- VH11 BCR-expressing CLL in the indicated mouse groups. To explore the impact of CD40L or AID-deficiency on BCR usage in CLL, we performed IghV and IglV sequence analyses in selected CLL samples with high tumor load (>95% IgMb+CD5+CD43+CD19+ CLL-like cells) (Supplementary Table 1). Interestingly, usage of the stereotypic VH11/Vκ14 BCR was significantly increased in CLL from IgH.TEμ.Cd40l−/− mice (n = 7/7, 100%), compared with control IgH.TEμ mice (n = 9/25, ~36%, Chi-square p < 0.001). Also CLL from IgH.TEμ.Aicda−/− mice showed increased VH11/Vκ14 usage (n = 9/13, ~69%) compared with control littermates (n = 7/20, ~35%, Chi-square p < 0.01) (Figures 2C,D). These VH11 CLL also expressed similar Igh CDR3 sequences (Supplementary Table 1). 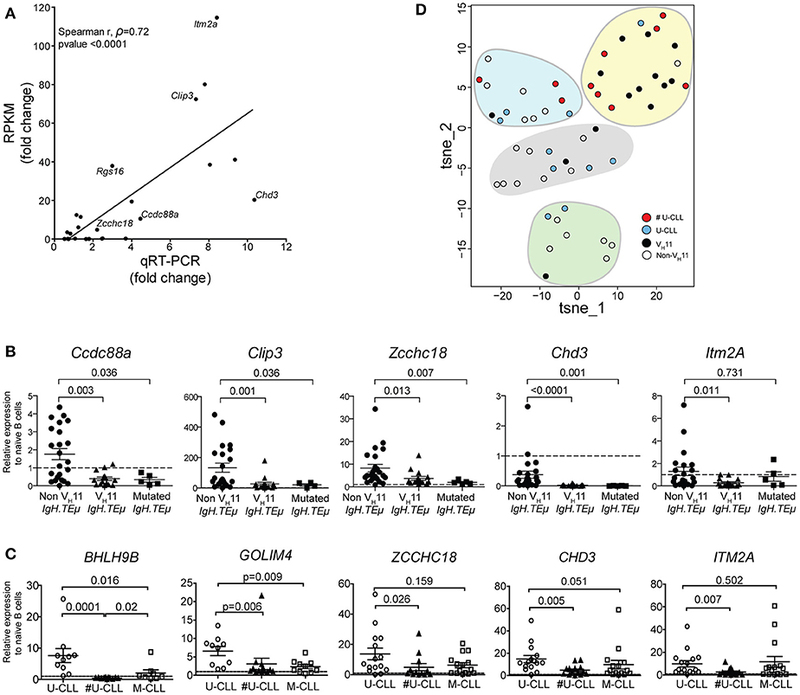 Taken together, these findings indicate that VH11/Vκ14-expressing CLL arise independently of T cell help or GC formation, whereas non-VH11 CLL is T cell-dependent and reduced in the absence of functional GCs in IgH.TEμ.Cd40l−/−and IgH.TEμ.Aicda−/− mice. To directly investigate whether antigenic stimulation in the context of T cell help affects CLL onset and the CLL BCR repertoire, we immunized IgH.TEμ mice with TNP-KLH coupled to alum (IgH.TEμ.TD, n = 20) to induce a TD B cell response. CLL onset did not differ between immunized and non-immunized littermates (n = 56) (Figure 3A). At the age of ~400 days, CLL incidence in IgH.TEμ.TD mice was ~65% similar to non-immunized control IgH.TEμ mice (~62%) (Figure 3A). Figure 3. CLL VH11 usage is dependent on antigenic stimulation. (A) Kaplan-Meier incidence curves of IgH.TEμ (dotted line) vs. IgH.TEμ.TD (solid line). (B) Pie charts summarizing the frequencies of VH11 (gray) and non-VH11 BCR-expressing CLL in the indicated mouse groups. Next, we analyzed IghV and IglV sequences in CLL samples with high tumor load (>95% IgMb+CD5+CD43+CD19+ CLL-like cells). In contrast to control IgH.TEμ mice, which showed ~35% (n = 7/20) VH11 usage, only 10% (n = 1/10) of IgH.TEμ.TD CLL expressed a VH11/Vκ14 BCR (Chi-square p = 0.09) (Figure 3B). The majority (n = 6/9, 67%) of CLL in IgH.TEμ.TD mice expressed a J558/VH1-family IghV gene and we did not observe mutated CLL (Supplementary Table 1). In summary, we found that robust TD immunization favors development of non-VH11 CLL. Our findings provide evidence that T cell-derived activation or selection signals, in particular CD40L, shape the BCR repertoire of CLL in IgH.TEμ mice, but do not significantly affect disease onset or progression. It is therefore conceivable that in the IgH.TEμ mouse model, BCR-derived signals may be more decisive for disease progression. To monitor the impact of BCR signaling strength on CLL development and IghV gene selection, we first crossed IgH.TEμ mice with E-Btk-2 transgenic mice. These mice express the constitutive active E41K-BTK mutant selectively in the B-cell lineage driven by the CD19 promoter (28). The E41K mutation enhances Btk membrane localization and thereby its activation by Syk or Src-family tyrosine kinases (35). E-Btk-2 mice show defective follicular B cell survival and a relative expansion of splenic B-1 cells (28). Flow cytometry analysis of E-Btk-2 B-1 cells did not reveal detectable PtC binding, indicating that VH11 BCR expression was limited (data not shown). We found that IgH.TEμ.E-Btk-2 mice (n = 21) developed CLL significantly earlier (mean age of onset of ~155 days), compared with control IgH.TEμ mice (~279 days; p < 0.0001) (Figure 4A). In addition, IgH.TEμ.E-Btk-2 mice appeared to have an increased disease frequency (~90% at ~400 days, compared with ~71% for control IgH.TEμ mice). Sequence analysis of Igh revealed that 1 out of 8 (~12%) tumors from IgH.TEμ.E-Btk-2 mice expressed a VH11 BCR, compared with 35% (n = 9/26) in the control IgH.TEμ group (Figure 4C, Supplementary Table 1). This difference was not statistically significant, but the finding of a PtC-reactive VH11 CLL was surprising, since PtC-binding B-1 cells were not detectable in E-Btk-2 mice. The majority (~71%; n = 5/7) of the non-VH11 BCRs expressed J558/VH1-family IghV genes. Figure 4. Onset of CLL is dependent on BCR signaling capacity in IgH.TEμ mice. Kaplan-Meier incidence curves of (A) IgH.TEμ (dotted line) vs. IgH.TEμ.E-Btk-2 (solid line) mice or (B) IgH.TEμ (dotted line) vs. IgH.TEμ.SiglecG−/− (solid line) transgenic mice. (C) Pie charts summarizing the frequencies of VH11 (gray) and non-VH11 BCR-expressing CLL in the indicated mouse groups. To confirm that enhanced BCR signaling affects disease onset, we crossed IgH.TEμ mice on a Siglec-G deficient background (IgH.TEμ.Siglec-G−/−). Siglec-G is a negative regulator of BCR-mediated signaling that is expressed in all B cells (27). It is a potent inhibitor of BCR-induced Ca2+ signaling and a key regulator of survival and selection of B-1 cells (36). In addition, Siglec-G-deficiency abrogates VH11 usage in B-1 cells (36). Similar to IgH.TEμ.E-Btk-2 mice, also IgH.TEμ.Siglec-G−/− mice displayed an increased disease frequency (~93 % at ~400 days, compared with ~70% for IgH.TEμ mice), with significantly accelerated CLL onset (~121 days compared with ~268 days for IgH.TEμ mice; p < 0.0001) (Figure 4B). IghV analyses showed a VH11/Vκ14 usage of ~18% (n = 2/11) in IgH.TEμ.Siglec-G−/− CLL vs. ~35% (9/26) in the control group (Chi-square p < 0.242) (Figure 4C, Supplementary Table 1). Only 2/11 IgH.TEμ.Siglec-G−/− CLL expressed J558/VH1-family IghV genes. Thus, BCR signaling strength plays an important role in CLL development in IgH.TEμ mice, whereby enhanced signaling accelerates disease onset. Because E-Btk-2 or Siglec-G−/− B-1 cells do not show detectable PtC expression, our findings suggest that those few VH11 B cells present are efficiently transformed to CLL in IgH.TEμ.E-Btk-2 or IgH.TEμ.Siglec-G−/− mice. Thus, BCR signaling strength may also affect the BCR repertoire in CLL. To further explore the biological phenotype of the VH11 and non-VH11 CLL subsets, we performed genome-wide gene expression profiling on primary IgH.TEμ CLL (tumor load >95%) expressing either a VH11 (n = 3) or a non-VH11 (n = 3) BCR. As a reference we included resting unstimulated (un-B, n = 4) and anti-IgM stimulated (αIgM-B, n = 4) naïve splenic B cells from wild-type mice. Normalized gene expression values (see Methods for details) were used for principle component analysis (PCA). The first two principal components, which represented ~70% of the total variation among the different samples analyzed, identified three separate clusters, corresponding to un-B, αIgM-B and primary IgH.TEμ CLL samples, indicating a strong correlation between biological replicates (Supplementary Figure 2). When we performed differential gene expression analysis (focusing only on genes passing a stringent statistical filter of Benjamini-Hochberg false discovery rate corrected P < 0.05), we found 148 differentially expressed genes (Figure 5A; Supplementary Table 2). Of these genes, 59 genes were upregulated in VH11 CLL and 89 genes were upregulated in non-VH11 CLL. To identify biological processes that underlie the transcriptional differences between VH11 and non-VH11 CLL, we performed pathway enrichment analysis using the Molecular Signatures Database (MSigDB) (37). Genes upregulated in VH11 CLL were functionally enriched for an interferon-mediated response, active Wnt signaling and constitutively active RAF1 signaling (Figure 5B, Supplementary Table 3A). On the other hand, genes downregulated in VH11 CLL were involved in quite diverse pathways, including interleukin-, epidermal growth factor receptor (EGFR)-, vascular endothelial growth factor (VEGF)-mediated signaling, metabolic processes, hypoxia and the UV radiation-induced stress response (Figure 5B, Supplementary Table 3A). Figure 5. A unique set of genes and pathways is upregulated in VH11 vs. non-VH11 CLL in IgH.TEμ mice. (A) Volcano plot showing P-values and fold changes in gene expression levels comparing VH11 and non-VH11 CLL from IgH.TEμ mice. Genes upregulated in non-VH11 CLL are indicated in red; genes upregulated in VH11 CLL in blue. Only significantly different genes (Benjamini-Hochberg adjusted p-value < 0.05) are shown. Genes indicated represent a subset of the validation gene set analyzed in a larger CLL (see Figure 7). (B) Oncogenic hallmark signatures enriched among differentially expressed genes in VH11 (n = 3) vs. non-VH11 (n = 3) CLL from IgH.TEμ mice. Taken together, these data suggest that in addition to a different origin, VH11 and non-VH11 CLL subsets display distinct transcriptional signatures, signifying differential activity of key signaling pathways. Next, we performed a PCA of the 148 differentially expressed genes between VH11 and non-VH11 CLL. To investigate the impact of T-cell-independent BCR stimulation and T-cell-dependent CD40 stimulation on differential gene expression, we included RNA-Seq gene expression values of the 148 genes from the unstimulated and αIgM-stimulated B cells described above, as well as previously reported gene expression values from anti-CD40/IL-4 stimulated follicular B-cells (α-CD40/IL4-B) (33). The first principal component (PC1) separated both CLL groups and the two stimulated B cell subsets from unstimulated B cells, suggesting IgH.TEμ CLL cells share a transcriptional signature related to activated B-cell phenotypes. Interestingly, PC2 revealed a strong similarity between αIgM-stimulated B cells and VH11 CLL on one hand and between α-CD40/IL4-stimulated B cells and non-VH11 CLL on the other hand (Figure 6A). These findings indicate more prominent BCR stimulation in VH11 than in non-VH11 CLL B cells in vivo and are consistent with a dependence on T-cell help for non-VH11 CLL. Figure 6. Genes discriminating VH11 from non-VH11 CLL show similarly distinct expression profiles in BCR or CD40-stimulated B-cells. (A) Principle component analysis (PCA) using the 148 differentially expressed genes defined in Figure 5A in unstimulated (n = 4, black), anti-IgM-stimulated (n = 4, green) WT splenic B cells, 1 day (n = 2, orange) or 2 day (n = 2, yellow) anti-CD40 plus IL-4 stimulated follicular B-cells (obtained from GSE77744), VH11-2+/Vk14-126+ BCR (n = 3, blue) and non-VH11 (n = 3, red) BCR-expressing CLL from IgH.TEμ mice. 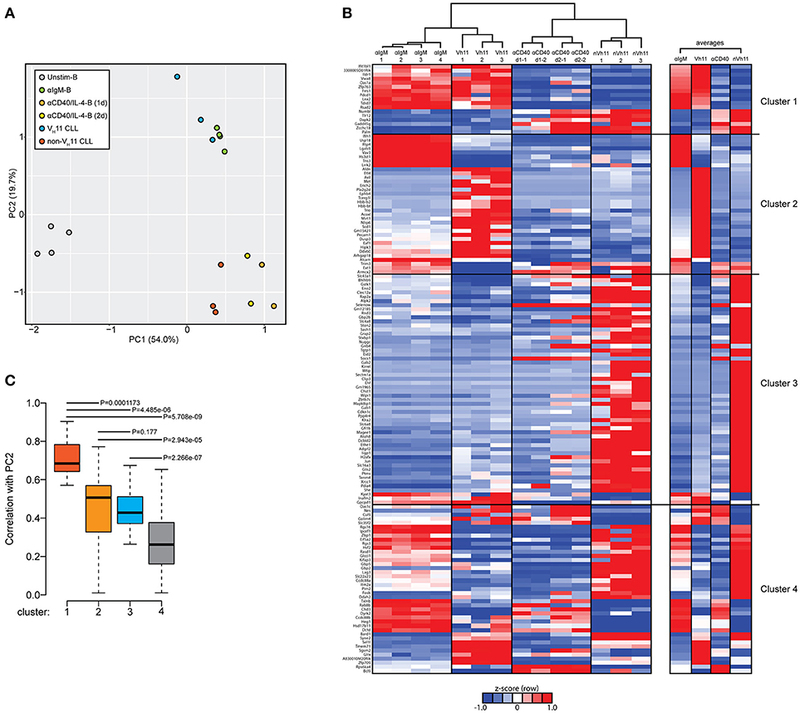 (B) Hierarchical clustering analysis (top) and accompanying heat map showing differences in expression levels (RPKM, shown as row Z-scores) of the 148 gene signature in anti-IgM-stimulated (n = 4) WT splenic B cells, 1 day (n = 2) or 2 day (n = 2) anti-CD40 plus IL-4 stimulated follicular B-cells, VH11 and non-VH11 CLL from IgH.TEμ mice. Heatmap shown on the right shows average expression levels for each group. (C) Boxplot showing average correlation values of each of the four gene clusters shown in B with principal component 2 (PC2) from the PCA shown in A. P-values were calculated using a Mann-Whitney U-test. To identify the gene signature underlying the clustering of αIgM-stimulated B cells and VH11 CLL, as well as α-CD40/IL-4-stimulated B cells and non-VH11 CLL, we performed hierarchical clustering analyses to separate the 148 genes into 4 clusters (Figure 6B, Supplementary Table 3B). Cluster 1 consists of 17 genes that were highly correlated between αIgM-stimulated B cells and VH11 CLL and between α-CD40/IL-4-stimulated B cells and non-VH11 CLL. Pathway enrichment analysis (Supplementary Table 3C) on this cluster revealed overrepresentation of genes involved in interferon response and KRAS signaling. Clusters 2 (35 genes) and Cluster 3 (56 genes) consist of genes that were highly correlated only between α-CD40/IL-4-stimulated B cells and non-VH11 CLL or only between αIgM-stimulated B cells and VH11 CLL, respectively. These clusters were enriched for interferon response/PI3K-AKT signaling genes (cluster 2) or UV response, epithelial-mesenchymal transition, glycolysis, hypoxia, unfolded protein response genes (cluster 3) (Supplementary Table 3C). Finally, cluster 4 (enriched for genes involved in the reactive oxygen species pathway) represents genes with low or anti-correlated expression values between the stimulated B cells and CLL. Thus, genes from clusters 1 and 3 signify the clustering of αIgM-stimulated B cells and VH11 CLL, while genes from clusters 1 and 2 drive the clustering of α-CD40/IL-4-stimulated B cells and non-VH11 CLL (Figure 6B). This analysis was further validated by computing the average correlation strength for each of the four gene clusters with PC2 from our PCA (Figure 6B). Indeed, clusters 1 to 3 underlying the αIgM-B cells and VH11 CLL and the α-CD40/IL-4-B cells and non-VH11 CLL segregation—and particularly cluster 1 genes—showed significantly stronger correlation values with PC2 than cluster 4 (Figure 6C). To further strengthen the existence of a unique transcriptional signature that differentiates VH11 and non-VH11 CLL B cells, we selected 24 robustly differentially expressed genes for validation. Some of these genes have already been shown to play a role in hematologic malignancies, including CLL (Pim-2, Met, Rgs16, Ccdc88a, Zcchc18, Clip3) (38–42), diffuse large B cell lymphoma, follicular lymphoma (Vav3) (43), acute lymphoblastic leukemia (ALL) (Itm2a, Chst1) (44, 45) or acute myeloid leukemia (AML) (Chd3) (46). Expression levels were validated by quantitative real-time PCR (qRT-PCR) in an extended cohort of 15 VH11 and 23 non-VH11 primary CLL from IgH.TEμ mice. Naïve Splenic B cells from wild type mice (n = 4) were included as controls. Comparison of RNA-Seq (RPKM) and qRT-PCR expression fold changes between the two CLL groups revealed highly correlated trends for these 24 genes (spearman correlation r = 0.72; p < 0.0001), validating our RNA-Seq analysis when extrapolated to a larger IgH.TEμ CLL cohort (Figure 7A). qRT-PCR validation showed that 11/24 (~46%) of the selected genes were significantly different (p < 0.05) between VH11 and non-VH11 CLL (Supplementary Table 4, Figure 7B). Additionally, 7/24 (~29%) genes were significantly different (p < 0.05) between non-VH11 CLL from IgH.TEμ and IgH.TEμ.Siglec-G−/− mice, which might be related to the altered VH usage in Siglec-G−/− mice or the early disease onset in IgH.TEμ.Siglec-G−/− mice. Figure 7. qRT-PCR validation of a subset of differentially expressed genes. (A) Correlation plot comparing fold-changes in expression between VH11 and non-VH11 CLL for 24 genes measured by RNA-Seq (RPKM) or qRT-PCR (spearman r, ρ = 0.72; p < 0.0001). The differentially expressed genes selected for further study are indicated. Characteristics of samples tested in qRT-PCR are provided in the Methods section (B) Expression of indicated genes as measured by qRT-PCR in VH11 (n = 15), non-VH11 (n = 23) and mutated (n = 5) CLL from IgH.TEμ mice. (C) Expression of indicated genes as measured by qRT-PCR in CLL cells from non-stereotypic U-CLL (n = 15), stereotypic U-CLL (#U-CLL, n = 14) and M-CLL (n = 15) patients. Bars in (B,C) represent mean ± SEM values. The expression values were calculated relative to expression in (B) naïve splenic WT B cells from mice (n = 4) or (C) naïve circulating B cells from healthy controls (n = 3), both of which were set to 1 (dashed line). Numbers indicate p-values (Mann-Whitney U-test). (D) t-SNE clustering analysis of the expression values for 13 signature genes (from Supplementary Table 7) using dCT values obtained by qRT-PCR for non-sterotypic (#U-CLL, n = 10) and stereotypic (U-CLL, n = 10) human U-CLL and non-VH11 (n = 21) and VH11 (n = 14) CLL from IgH.TEμ mice, as indicated. Expression values were converted to Z-scores separately for mouse and human datasets to allow combined t-SNE analysis. Expression of five of these 13 genes that were significantly upregulated in non-VH11 CLL vs. VH11 CLL (Ccdc88a, Clip3, Zcchc18, Chd3, Itm2a) was also evaluated in five mutated IgH.TEμ CLL, defined by < 97% IghV germline identity [Supplementary Table 1 and ter Brugge et al. (22)]. Interestingly, qRT-PCR analysis showed that four out of five tested genes (except Itm2a) were expressed at low levels in mutated CLL, similar to VH11 CLL (Figure 7B). Thus, non-VH11 unmutated CLL in IgH.TEμ mice represent a unique subset that can be distinguished from VH11 unmutated and from mutated CLL by a specific transcriptional signature. Furthermore, correlation analyses indicated that within the non-stereotypic subgroup in particular VH1 CLL represents the most heterogeneous CLL subgroup in IgH.TEμ mice (n = 16; average spearman r, ρ = 0.280; Supplementary Figure 3). In these analyses we also found that expression of these five genes is positively correlated in VH11 CLL (n = 15; average spearman r, ρ = 0.537) and in the small non-VH11/non-VH1 CLL subgroups (n = 6; average spearman r, ρ = 0.703) (Supplementary Figure 3). Next, we evaluated the expression of the 13 signature genes in a panel of 44 human CLL samples (15 non-stereotypic U-CLL, 14 stereotypic U-CLL, 15 M-CLL, Supplementary Table 5) by qRT-PCR. Hereby, 6/13 (~46%) genes (CCDC88A, CLIP3, ZCCHC18, CHD3, ITM2A, GOLIM4) were significantly higher expressed in all three CLL subsets than in naïve B-cells from healthy individuals, suggesting a role for these genes in CLL (Figure 7C, Supplementary Table 6). Expression of CLIP3 was significantly higher in non-stereotypic than M-CLL. Expression of ZCCHC18, CHD3, GOLIM4, BHLH9B, and ITM2A was significantly higher in non-stereotypic U-CLL compared to stereotypic U-CLL (Figure 7C). To compute any parallel between stereotypic and heterogeneous U-CLL from patients and IgH.TEμ mice, we performed t-SNE clustering analysis on expression values for the 13 signature genes (Figure 7D, Supplementary Table 6). We used dCT values obtained by qRT-PCR for non-sterotypic (#U-CLL, n = 10) and stereotypic (U-CLL, n = 10) U-CLL as well as for non-VH11 (n = 21) and VH11 (n = 14) CLL from IgH.TEμ mice. Interestingly, 7/10 stereotypic U-CLL clustered with 10/14 VH11 CLL (Figure 7D). Conversely, non-stereotypic human U-CLL and mouse non-VH11 CLL showed a more heterogeneous distribution into several clusters largely devoid of stereotypic human U-CLL or mouse VH11 CLL. Taken together, we conclude that differences in the expression of these signature genes in heterogeneous U-CLL, stereotyped U-CLL and M-CLL were partly overlapping between human CLL and the corresponding CLL subgroups in our IgH.TEμ CLL mouse model. In this report, we investigated the role of antigenic pressure and BCR signaling thresholds on clonal selection of CLL cells in the IgH.TEμ CLL mouse model. We found that U-CLL tumors that develop in these mice can be classified into two different groups based on their IghV usage. The stereotypic VH11-2/V κ14-126 CLL subset recognized the PtC self-antigen, developed independently of T cell help or GC formation and represented a somewhat more aggressive type of CLL. Proportions of VH11/Vκ14-expressing CLL were increased in the absence of functional germinal centers in IgH.TEμ mice deficient for CD40L or activation-induced cytidine deaminase. Conversely, in vivo T cell-dependent immunization decreased the proportions of VH11/Vκ14-expressing CLL. Mice were immunized at 10–12 weeks of age, with a secondary immunization at 15–17 weeks of age. In a proportion of mice at these time points, CLL cells become detectable in peripheral blood (Figure 1). In our immunization model the onset or frequency of CLL was not altered, but we cannot exclude that there will be effects on CLL onset or disease progression when immunizations are performed at a different age. Consistent with the observed effects of defective germinal center function or robust T-cell dependent immunization on VH usage in CLL, PCA of a gene signature comprised of 148 genes differentially expressed between VH11 and non-VH11 CLL revealed that VH11 and non-VH11 CLL clustered with BCR-stimulated and anti-CD40-stimulated B cells, respectively. The unmutated VH11 CLL cells parallel B-1 cells, because these also have a restricted BCR repertoire, may recognize auto-antigens including PtC, and produce natural IgM antibodies in the absence of T cell co-stimulation (12). In concordance, it was recently shown that peritoneal CD5+ B-1 cells generated early during fetal or neonatal development, increase in number over time and can progress into CLL in aged mice (47, 48). Interestingly, CLL development in these mice was linked to the expression of a restricted BCR repertoire (VHQ52/V κ9 or VH3609/V κ21, reactive toward non-muscle myosin-IIA or Thy-1, respectively) independent of CD40 signaling. Hereby, expression of the Eμ-TCL1 transgene enhanced aggressiveness of the disease. Non-VH11 CLL, on the other hand, consisted of tumors with heterogeneous IghV/IglV expression and CDR3 length, lacking affinity for PtC. Although these tumors were T-cell dependent, strongly reduced in the absence of functional GCs, their BCRs were not hypermutated (<3%). This is in line with findings in human U-CLL, indicating that U-CLL cells can recognize both TD and TI autoantigens that have relocated to the external cell surface during apoptosis (11, 13, 14). Our observations are also consistent with gene expression profiling studies suggesting that U-CLL reflect memory B cells (49). In contrast, more recent transcriptome analyses revealed that U-CLL resemble mature pre-GC CD5+CD27− B cells, while M-CLL resembles a distinct, previously unrecognized, CD5+CD27+ post–GC B cell subset (18). Our findings imply that in mice unmutated CLL can be derived from (i) T cell-independent B-1 cells (e.g., PtC-recognizing VH11-2/Vκ14-126) or (ii) from B cells that recognize their antigen in the presence of cognate T-cell help and are activated without SHM. This latter group of T cell-dependent unmutated CLL displayed an expression signature, as defined by 13 genes including the CCDC88A-CLIP3-ZCCHC18-CHD3-ITM2A module, that is not only different from TI unmutated CLL, but also from mutated CLL in the IgH.TEμ mouse model. Moreover, we found evidence that this expression signature may be partly associated with non-stereotypic human U-CLL, suggesting that the development of human U-CLL can also be TD. Such TD U-CLL may derive from B cells involved in an extra-follicular response or alternatively may be related to auto-antibody producing B cells in mice that were shown to recognize TD antigens, mount a rapid IgM response and enter GCs, but do not develop into IgG-expressing plasma cells (50, 51). Although our data suggest a role for T-cell help in human non-stereotypic U-CLL pathophysiology, further investigation is required to translate our findings to human disease. Such studies should include expression profiling of (1) large CLL patient cohorts containing a wide range of stereotypic and non-stereotypic U-CLL samples and (2) activated B cells that received various stimulations including anti-CD40. Gene expression profiling revealed a set of genes that distinguish VH11 from non-VH11 CLL and are similarly regulated in BCR or CD40-stimulated cells, respectively. This observation probably reflects differences in supporting external cues: pathways induced by interleukin or growth factor-mediated signaling were specifically upregulated in non-VH11 CLL. These include the regulator of G-protein signaling 16, Rgs16, which is upregulated in autoimmune B cells of BXD2 mice and enhances GC formation by the canonical NF-κB pathway, signifying the post-GC origin of non-VH11 CLL (52, 53). Second, the actin-binding protein Ccdc88a, which plays a role in cytoskeletal remodeling and cell migration following activation of Akt downstream of EGFR (54) and can also enhance Akt signaling (42, 55). Third, integral membrane protein 2A (Itm2a) is a type II integral membrane protein that has been associated with an enhanced GATA3-mediated regulatory network in B ALL (56). Chd3 encodes a chromatin remodeler with unexplored function in lymphocytes. On the other hand, Wnt-associated genes were specifically upregulated in VH11 tumors, which is interesting because the BTK-inhibitor ibrutinib restrains Wnt signaling in CLL (57). Although the function of several other upregulated genes is currently unknown, Zcchc18 has been associated with a CLL-specific transcriptomic signature (42) and Clip3 was differentially regulated in a CLL patient undergoing spontaneous regression (58). Notably, many gene sets or pathways were active in both CLL subsets, including high expression levels of MET receptor tyrosine kinase, which prolongs CLL cell survival through STAT3 and AKT phosphorylation (40, 59). This could contribute to the enhanced constitutive activation of the p-Akt/p-S6 pathway in IgH.TEμ CLL as reported previously (23, 24). Additionally, genes involved in KRAS signaling were highly expressed in both CLL subsets, consistent with its essential role in B cell lymphopoesis (60), particularly for B-1 cells recognizing PtC (61). Our data also indicated that availability of T cell help and GC formation did not affect tumor incidence or onset. In contrast, the finding of a significantly earlier CLL incidence of mainly the non-VH11 type in IgH.TEμ.Siglec-G−/− and IgH.TEμ.E-Btk-2 mice suggests that BCR signaling thresholds are a key factor in determining CLL disease course. Yet, the appearance of VH11 CLL in these mouse lines may indicate a substantial selective advantage of these clones, because in Siglec-G−/− and E-Btk-2 transgenic mice the frequency of PtC-recognizing cells within the B-1 cell population is very low (28, 36). In conclusion, we found that the formation of a major subset of unmutated CLL in IgH.TEμ mice is dependent on T cell signals. Our findings therefore provide a mechanistic explanation for the role of B-cell intrinsic factors, in particular BCR signaling, as well as extrinsic factors such as T cell help and support from the tumor microenvironment, in shaping the repertoire of CLL in mice. These findings are of potential clinical relevance, because B-cell extrinsic signals may reflect effective targets for novel therapeutic strategies in CLL patients. SPS designed the research studies, performed experiments, analyzed the data, and wrote the manuscript. MdB, SP, RM, and MdA performed experiments and analyzed the data. RS analyzed RNA sequencing data and contributed to writing the manuscript. AL and LN contributed to the research design and the writing of the manuscript. RH contributed to the research design and the writing of the manuscript and supervised the study. All co-authors approved the final manuscript. These studies were partly supported by the Dutch Cancer Society (KWF 2014-6564), the Association for International Cancer Research (10-562) to RH, NWO (to SPS) and a NWO Veni Fellowship (Grant No. 91617114) to RS. SP was affiliated to Erasmus MC Rotterdam whilst this study was completed. After finishing the work, he founded the company EpiExpressions. We thank Laurens P. Kil, Alice F. Muggen, Melanie Lukkes and Catarina da Graça (all Erasmus MC) and Arnon P. Kater (Amsterdam Medical Center, Amsterdam, The Netherlands) for assistance and advice. 3. Damle RN, Wasil T, Fais F, Ghiotto F, Valetto A, Allen SL, et al. Ig V gene mutation status and CD38 expression as novel prognostic indicators in chronic lymphocytic leukemia. Blood (1999) 94:1840–7. 4. Hamblin TJ, Davis Z, Gardiner A, Oscier DG, Stevenson FK. Unmutated Ig V(H) genes are associated with a more aggressive form of chronic lymphocytic leukemia. Blood (1999) 94:1848–54. 23. Kil LP, de Bruijn MJ, van Hulst JA, Langerak AW, Yuvaraj S, Hendriks RW. Bruton's tyrosine kinase mediated signaling enhances leukemogenesis in a mouse model for chronic lymphocytic leukemia. Am J Blood Res. (2013) 3:71–83. Copyright © 2018 Pal Singh, de Bruijn, de Almeida, Meijers, Nitschke, Langerak, Pillai, Stadhouders and Hendriks. This is an open-access article distributed under the terms of the Creative Commons Attribution License (CC BY). The use, distribution or reproduction in other forums is permitted, provided the original author(s) and the copyright owner(s) are credited and that the original publication in this journal is cited, in accordance with accepted academic practice. No use, distribution or reproduction is permitted which does not comply with these terms.